Welcome to Captain's Cove! A quiet 27-unit community in Indian Shores, FL located directly on the intracoastal waters and right across the street from the white sands beach: the best of both worlds! See a variety of birds, mullet that jump high out of the water and even stingrays, dolphins and manatees right off the balcony! The complex also has a private pier where you can fish or watch the boats go by. Spend mornings out on the balcony with the triple-paned sliding glass door boasting a breathtaking water view as you sip your coffee, or in the evenings enjoy a glass of wine and watch the fish jump. The beach access is just a few hundred yards away from your door! Built in 2002, this top-floor unit has a spacious living area with a 50-inch smart TV, high-speed internet, and brand new (2018) sofa and loveseat with pull-out queen memory foam mattress for extra guests. The open floor plan also has a dining area with new table and chairs as well as additional seating at the kitchen counter. Enjoy the huge master with walk-in closet and private bathroom, brand new furniture (king bed) and flat screen tv. The second bedroom has twin beds and its own tv and shares the spacious hall bath with tub. All bedding is new and all beds have down-alternative comforters with crisp fresh duvet covers. This condo includes everything you need: new dishes, glasses, utensils, and appliances including a dishwasher. Beach chairs, umbrella, beach towels and a wheeled cooler will help you enjoy the beach. Other amenities include a heated pool, covered parking and in-unit washer/dryer. You can enjoy the quiet, peaceful tranquility of Indian Shores as home base, with endless activities nearby. Travel just a few miles north by car, trolley or Uber/Lyft to see all that Clearwater Beach has to offer, or just down Gulf Blvd to John's Pass, Treasure Island and St. Pete Beach. Also a short drive away is downtown St. Pete, boasting miles of shops, museums, restaurants and brewpubs. Make sure you find time to marvel at downtown’s street art! There is plenty within walking distance as well, including an ice cream shop, bars, restaurants and a convenience / bait store. Gear can be rented just down the street for you to enjoy kayaking, boating, paddleboarding, biking and more. Two items to note before choosing this property: it is on the second floor, and there is no elevator. So you will have to go up and down steps - 28 of them to be exact. Also, there is under-building parking that had a vehicle limit of 6 feet 6 inches; if your vehicle exceeds that, you are welcome to park out front. Upstate NY winters were the perfect motivation to seek out this property. Once I saw the view from the balcony, I knew this was the one! I pride myself in quick responses and being reachable at all times so you can have a worry-free vacation. This was our first rental experience and it was amazing! The host was very responsive and the condo had provisions that we hadn't even thought of needing. We especially enjoyed the balcony on the water and the location is perfect for families. The condo, sunsets, beach walks at sunrise, biking. It was all wonderful. Restaurants were great but the well supplied kitchen was perfect for cooking in. The condo Owner is very responsive to any need and is very easy to communicate with. Our stay at Captains Cove was absolutely perfect. The owner is a extremely accommodating and is a pleasure to interact with. The condo became our home away from home, the balcony overlooking the water was our happy place. The condo is equipped with everything you need to make meals if you prefer to cook. It also has plenty of restaurants some within walking distance or a short drive. Looking forward to our return. The most perfect, relaxing family getaway! I can’t say enough good things about Jean’s beautiful condo in Indian Shores. The views were spectacular and everything we could possibly need was provided, from beach towels/chairs to paper towels. 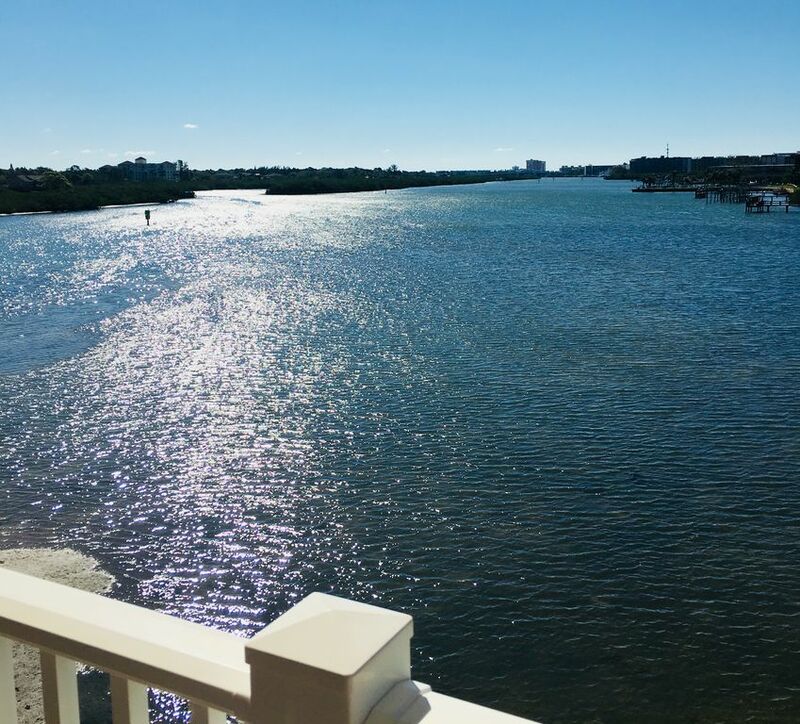 Waking up to coffee on the balcony overlooking the intercostal was so relaxing. We didn’t see any dolphins or manatees from the balcony, but enjoyed the jumping fish, beautiful boats, & the birdwatching. Our kids loved the pool & the safety of riding their scooters throughout the complex. LuLu’s Ice Cream is a must, & is just steps away. The beach was not crowded and the sand is perfect for riding bikes. We did see a couple of dolphins in the gulf & even found a shark tooth, along with many beautiful shells. A short drive to John’s Pass in Mediera Beach was fun, & our favorite restaurant was The Conch House in North Redington Beach. Sandy’s in Indian Rocks Beach has the best breakfast around, but we also bought groceries from Publix and enjoyed cooking in the condo too. We couldn’t believe how quiet it was at Captain’s Cove, which made our stay even more relaxing. Everyone we met was very friendly and we felt safe everywhere we went. Not everyone stops at the flashing crosswalks, so be sure kids know to stop and look both ways before crossing the street to the beach. The unit was super clean, bright with natural light, beautifully decorated, and the grounds were very well maintained. We certainly hope to return in the near future! Couldn’t have asked for a better week! Jean has thought of everything to make a stay easy, fun and welcoming. After visiting and driving through Treasure Island, St. Pete, Madeira Beach, etc. we realized how great it was to come back to Indian Shores. We love the activities and restaurants that those nearby places offer, but Indian Shores is just so peaceful and calming. This property has great restaurants nearby - both within walking distance as well as a short drive. We had no difficulties in getting an Uber or Lyft when we decided not to walk or drive ourselves. We really enjoyed our stay, whether out and about or in the condo with the amazing view. We highly recommend this property. Jean was wonderful. Very accommodating to our last minute early check in request even considering the holiday. Perfect location and stocked with everything we needed. We did not want to leave.